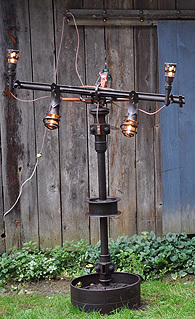 Pellerin's "hot rod lamps" usually have multiple fixtures. How does Phil Pellerin see art in junk? Or is that junk in the art? As Phil says, "I thrive on taking what other people consider junk and making something beautiful and functional out of it. I enjoy provoking people and am happy to snap them out of their comas, if only briefly." The Vermont Farmer Art desk is a sophisticated marvel with a seat that rises and lowers, and a USB port for electronic convenience. Growing up on a small farm in Westminster, Phil learned how to build things and how to make something out of nothing. Becoming a builder became a way to support his family; becoming an artist became a way to combine his life and his loves. When he came up with a name for his business, he didn't have to go far—Vermont Farmer Art. Phil Pellerin is a farmer, carpenter, timber framer, stone worker, blacksmith, and artist. While he has done all of these things for most of his life, he says it's only in the last two years that he has considered himself a professional artist. And all of the above vocations have combined to make him the artist he is. Phil looks at a pile of junk with different eyes than the rest of us. He finds old things around the farm, around job sites, in scrapyards, out in the woods or waterways. Now that his art work has been seen, friends bring him more stuff they know he can use. Old car and tractor parts, odd pieces of metal, stones with interesting shapes, driftwood, antique farm equipment, and detritus from farmyard scrap heaps are all fodder for the next sculpture. His sculptures are one of a kind, and only Phil knows how he decides to make what he makes. "Ninety percent of the time I know what I'm going to make with a part as soon as I see it. Sometimes it takes a while to find all the pieces I need to complete the project. I might have a few projects going at once." The giant motorcycle sculpture that has been seen in Brattleboro, Putney, or during motorcycle week in Laconia, N.H., took three years to assemble, after finding the perfect wheels in a sawmill scrap pile. Lamps may be made from kerosene cans, buckets, bowls, or parts usually seen on a hot rod. 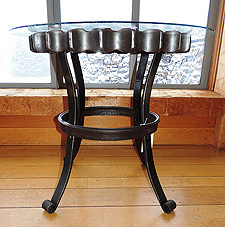 A table may be made from ancient excavator parts. Saw mill and tractor parts become a desk. Wrenches become animals or people. Here is a partial list of the components in the Vermont Farmer Art desk: saw mill bull wheel, Ford Model A jack, John Deere horse-drawn harrow seat, bit brace, John Deere tractor counterweights, barn door hinge, wash tub, hay fork, tire patch kit, and wagon step. Add a piece of glass found in an entertainment center, an electrical outlet with a USB charging station, a lamp, and a copper spike lightning rod and you have a unique desk with modern amenities. The seat raises, lowers, and spins—it's a desk with a view. Phil lives in Westminster West, where he plans to open his studio/workshop to the public soon. He also welcomes commissioned work. His website provides more examples of his work: www.vtfarmerart.com. Phil Pellerin's work can be seen this month at the Southeastern Vermont Welcome Center on Interstate 91 in Guilford. 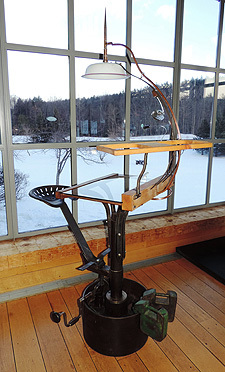 On display are the Vermont Farmer Art desk, a hot rod floor lamp, and an excavator gear table. The center is open from 7:00 a.m. through 11:00 p.m.